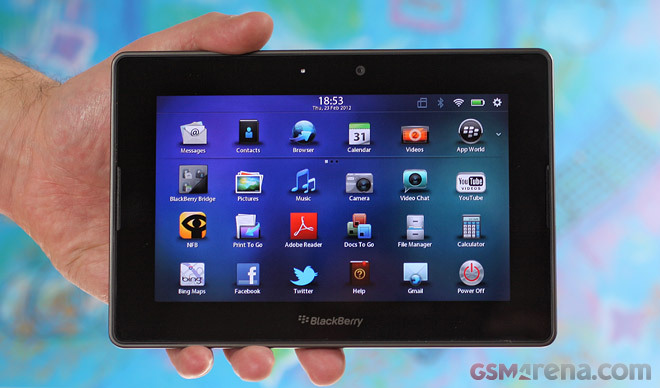 The BlackBerry Playbook OS 2.0 was hotly anticipated, so the news about it seeding the other day spread like wildfire. I spent a few hours of quality time with my Playbook on 2.0, so I’m ready to give you all the details on what’s hot and what is, well, not so much. And before we continue, I want to answer the most frequent question I got since the release came out: No, you can’t simply drop an Android app on it, install it and use it just like that. It’s an important chunk of information that was known ever since the beta 2.0 leaked, but one that many people have missed for one reason or another. The BlackBerry Playbook OS 2.0 does not allow you to install Android apps directly, but it allows developers to port them really easily into the .BAR format, which would then be able to run on the Playbook. RIM would also prefer it that you do not download apps from sources other than the AppWorld. Ok, now that I got that out of the way, let’s see what novelties the Playbook OS 2.0 brings along. New menu layout with a permanent shortcut dock, multiple panes and app folders. The hotly anticipated Messages, Calendar and Contacts apps are now here. There’s also an updated Video Chat with automatic filtering of available chat partners. New distraction-free Reading mode in the web browser. There is now a dedicated File manager and a PrintToGo app for computer-to-Playbook file transfers. There are new apps in the AppWorld, supposedly ported from Android. Updated BlackBerry Bridge allows the use of a BB smartphone as a remote mouse and keyboard. Playbook OS 2.0 users get the Modern Combat 2: Black Pegasus and Asphalt 6 games for free. On a negative note, the Wi-Fi connection is still buggy and drops randomly, and the AppWorld still gets stuck at times like before. There’s still no way to connect to a new Wi-Fi hotspot from the homescreen – you have to dig through the Settings for that. The Video player still doesn’t auto resume from the last point you played to and it doesn’t support AC3 sound in videos. I really hope a nice Android video player gets ported to the AppWorld. But let’s go through some of the new stuff in a more detailed manner. Oooh, a title with two “-ment” words – things just got serious. Jokes aside, the permanently visible new icon dock gets you access to a set of six shortcuts. The rest of the icons are organized into panes. Each pane is scrollable vertically, while naturally, you change panes with a vertical swipe. You can have several such panes. Gone is the oversimplified filtering by All/Favorites/Media/Games. The Multitasking tabs are also bigger and contain a clear text title underneath each tab. Also, now you can rearrange icons or group them into folders just like in iOS. A nifty new feature allows you to actually uninstall apps in icon edit mode by tapping the X overlay in the corner. Again, just like iOS. There’s a new Accounts management pane that allows you to setup online mail, calendar and contacts, and have them sync with their respective newly-added apps – Messages, Calendar and Contacts. New in this accounts pane is the option to setup a Facebook, Twitter and LinkedIn account. These are used in the Messages app and allow you to send and receive Facebook and Twitter messages natively. The contacts app also syncs with Facebook and displays your Facebook contacts. Once you setup your personal accounts on Playbook (we used a regular Gmail account), the Contacts app, the Calendar app and the Messages app get populated by the information stored in the cloud. You can have several accounts sync simultaneously with the apps. For instance, I synced two Gmail accounts and a Facebook one, and as a result, my Calendar and Contacts received all the info from my three accounts. You can filter the information in these apps by their respective account, but the interface to do that (the account selector, as I call it) looks and works differently in Messages than it does in the Calendar. This is not very user-friendly. The Messages app is rightfully called more than simply Mail, as it hosts your Facebook chats and Twitter’s direct messages as well. It’s important to note that you do not need a BIS account to setup mail on the device. Unlike any BlackBerry smartphone, the PlayBook acts more like a conventional smart device that doesn’t need to be set up with a special email plan. Unfortunately, they still haven’t come up with a portrait version, and I would have preferred having the option of using a portrait keyboard. The Calendar has a really neat interface and lots of options. Syncing it to several accounts is not a problem either – even Facebook calendar was no fuss. The Contacts app is as versatile as a smartphone’s one would be. It’s just that you can’t really call anybody from here unless you have paired the tablet with a BlackBerry smartphone. But even without calling functionality, it’s a great contact management app. It syncs all accounts activated on the Playbook, even the Facebook one. For your Facebook contacts, you can even check their latest status updates straight from here. Contact pics are downloaded both from Gmail and Facebook in this case. Contacts who are available for the Playbook’s proprietary Video Chat are automatically singled out by the filtering system of the app. RIM are tauting the Playbook OS 2.0 for its improved video chatting with higher quality and multi-tasking support. Even if that is the case, its use is still limited. But that’s a minor thing – I haven’t Facetime’d anyone on my iPhone 4 yet, even though I have a lot more contacts available for that. Videocalling might sound like a fancy feature, but it’s not that big a deal. A new notifications system is in place on the homescreen to notify you of new messages and pending calendar events. When the Playbook is in standby mode, the charging LED will act as a notification light (that, luckily, is configurable). The Reading mode was a nice surprise, as unlike the other new stuff, I didn’t know it was coming. It works nicely but I have yet to read more articles to actually be sure it works without a hitch. The newly added file manager lists all the files available on the Playbook regardless of their type and allows you to make searches or easily delete files individually or en masse. You also have the option to open a file with its respective viewer. The new apps ported from Android are not obvious as they are not marked or filtered by any means and I struggled to find some. Noteworthy additions see productivity apps such as the official WordPress app, Evernote, the Box.NET app and Dolphin HD, while new game titles include smash hits such as Plants vs. Zombies and Cut the Rope. I did notice some games that I believe I haven’t seen before, but I’m a only a casual gamer, so I may be incorrect. These include Start Front: Collision HD, Let’s Golf 2 HD, UNO HD, Earth and Legend, Eternal Legacy HD, N.O.V.A. 2 HD, Real Football 2011 HD, Monopoly, and Bejeweled 2. The AppWorld is actually available online so you can check the available apps there if you are still considering your Playbook purchase. I’m still waiting some more popular communication apps such as Skype, Tango, Viber or WhatsApp Messenger. There is also nothing new in the Navigation and Location services sections of the AppWorld – there is still no way of using offline maps on the Playbook and no turn-by-turn navigation. But I suppose things will change by the day from now on. RIM is also throwing in a couple of freebies to celebrate the release of 2.0. You probably remember that the NFS Underground game is available for free to any Playbook user ever since the tablet was released. Now Playbook users also get Modern Combat 2: Black Pegasus for free (damn, I actually paid for that one not long ago) and Asphalt 6, which honestly, I’m already sick of playing across a wide variety of platforms and screen sizes. RIM has also pre-installed a nice and handy application called Print To Go. It may very well have been there in the first place, but I skip apps that have “Print” in their name by default. However, this time the title is misleading. It’s not about wireless printing but instead deals with sending stuff from your computer to your Playbook wirelessly. To setup the system, you download an app to your computer from BlackBerry’s website. It installs a virtual printer on your computer and every time you choose it to print stuff such as a document, map, or whatever, it gets sent to your Playbook via an encrypted connection. That’s one title I never thought I would use for BlackBerry’s tablet. But I’m optimistic. RIM finally delivered on the much awaited software update and from now on, it’s hopefully only a matter of time before we get to see many more popular Android titles ported to the AppWorld. Plus, if you are the tech type, you can always fire up Developer mode on the Playbook and sideload some of your own. Just search for .BAR files online. The Playbook 2.0 is a great stride forward for RIM. It’s been almost a year since the Playbook was released and perhaps it’s too late to save it, but it may well set the stage for something new. Rumors have it that RIM is already working on a 10-incher.